Published on October 20, 2014 by Martyn. Be the first to comment! 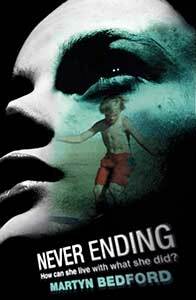 Smashing news to start the week, with Never Ending‘s inclusion on the list of books nominated for the 2015 CILIP Carnegie Medal, the most prestigious prize in children’s and teenage fiction. I’m also pleased to see five other titles from Walker Books on the list – congratulations to Catherine Johnson (Sawbones), Tanya Landman (Buffalo Soldier), Anthony McGowan (Hello Darkness), Patrick Ness (More Than This) and Non Pratt (Trouble). The nominations will be whittled down to a longlist in February, then a shortlist in March, with the overall winner declared next June. Click here to visit the Carnegie site for the full list of nominated books.